GADCHIROLI in Maharashtra may have acquired the model district status for clearing a record number of community forest rights (CFR) claims, but its 298 villages are angry with the forest department for stripping them of the basic right to manage forest produce. The department has also burdened them with conditions, reducing the CFR under the Forest Rights Act, 2006, to a mere hogwash. In Ghati village, people have been fighting a year-long battle with the forest department. They have not allowed officials to cart away timber worth Rs 2 crore which the department had felled in March 2010. 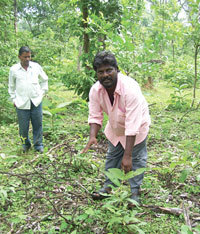 People say the department should have consulted the village panchayat before felling the forest produce. Officials say nothing was done against the law. Protesting the department’s “high-handedness”, people started agitation in April 2010. But the administration has not uttered a word on the issue. Repeated arbitrations by the police and the district collector have failed to resolve the impasse. 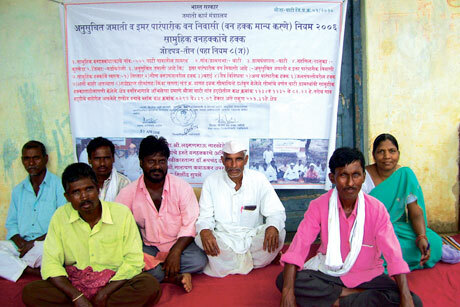 The first few CFR claims in Gadchiroli were granted in August 2009 to Mendha Lekha and Marda villages. After this, claims were issued only when people protested in April 2010. Treatment to these claims were in contrast to the claims issued to Mendha Lekha and Marda. All claims of these two villages were cleared with no conditions attached. For villages like Ghati, district committee of the FRA spelled out specific rights under nistaar (collecting forest produce for their own livelihood), minor forest produce and grazing. It, however, omitted the crucial right to “protect, regenerate, conserve and manage community forest resources which they have been traditionally protecting and conserving for sustainable use”. This is sighted in Section 3.1.i of the FRA. It also inserted seven conditions in the claim papers (see ‘Conditions apply’ on page 9). Omission of the crucial right and imposition of conditions are against the letter and spirit of the FRA, says Roopchand Dakhne, FRA committee president in Ghati. “The Act grants gram sabha the ownership right over MFP and management right over the forest area. This means it has the right to make all rules pertaining to management of forests, decide on conservation and extraction, and accept or reject any working plan. The district committee is playing a dirty trick by omitting the crucial right from our claims,” adds Dakhne. Atul Patne, the district collector, is indifferent. “We have neither granted nor denied the right to manage in writing,” he says, adding that he has given a verbal order that all villages can formulate their own working plans in consultation with the officials. However, he could not explain why this was not specified in the claim papers. Patne has since been transferred. R M Ramanujam, district conservator of forests, Wadsa division, who was instrumental in imposing the riders, says the department’s working plan is valid for 10 years and it has not asked the Union Ministry of Environment and Forests to cancel it to enable villagers to formulate their own plans. The administration says about 137,000 hectares (ha) of forestland in the district has been granted under CFR claim. But people complain the land is less than what they had claimed under the community rights. The administration did not even give a reason for this, they say. In Ghati, people had claimed 913.13 ha, but received just 521.31 ha. Potegaon, Kalshi and Rajoli villages in Gadchiroli tehsil had claimed 305 ha, 550 ha and 2,025 ha respectively, but got 222.77 ha, 201.96 ha and 1,468.94 ha. “We had claimed land under nistaar, Joint Forest Management and additional land traditionally protected by the people, as provided under the FRA,” says Gyaneshwar Sahare, resident of Ghati. Villages Salhe, Dodke, Aswalhudki and Bhuryaldand in Korchi tehsil, which had applied for nistaar land, got around one-third of their claims. “We compared the claim papers with the nistaar records and allotted whatever was less,” says Patne. Some, however, had applied as per the nistaar records and yet got less. The administration has no right to alter land allotment, says Mohan Hirabai Hiralal of the non-profit Vrikshamitra. “Its job is just to clear the claims,” he adds. An estimated 100 villages have registered their complaints with the State Level Monitoring Committee and demanded inclusion of omitted rights, removal of riders and correction of land allotments. But the committee has not even acknowledged receipt of notices, they allege. Replies to Right To Information queries by Ghati residents reveal the complaint files have been bouncing from one office to another. State’s Department of Tribal Development’s office in Mumbai forwarded them to the Tribal Research and Training Institute (TRTI) in Pune and to the district collector for action in July 2010. TRTI, responsible for monitoring implementation of FRA, forwarded the files to the Tribal Development Collectorate in Nashik. This too, sent the files to the district collectorate in May 2011. No action has been taken yet.